The first bananas were harvested in a Wageningen Greenhouse, according to the Wageningen World Magazine. Researchers have been growing them above ground in order to trying to outsmart the Panama disease caused by Fusarium Wilt, which is threatening the banana population around the world. From all sides researchers are looking for approaches, e.g., genetics and growing conditions, to making global cultivation more sustainable. Check out this article in Wageningen World. New methods to efficiently monitor Panama disease, also known as Fusarium wilt, caused by Fusarium species in bananaswere developed during the PhD research of Fernando Garcia-Bastidas at Wageningen University and Research. These new methods and trials enabled a close monitoring of the international and intercontinental dissemination of the so-called Tropical Race 4 (TR4) strain of Fusarium odoratissimum, a new species originating from Indonesia that devastates banana plantations of Cavendish as well as many other local varieties around the world. Fernando Garcia-Bastidas defended his dissertation entitled ‘Panama disease in banana: Spread, screens and genes’ on March 19, 2019 at Wageningen University. The thesis describes the developing pandemic of a Fusarium species, which causes Panama disease in banana. He focused his research on the genetic diversity for resistance towards a panel of Fusarium strains representing global pathogenic diversity and aspects of the molecular interaction between the fungus and the host. The thesis further explores the resistance to TR4 in a wide panel of banana accessions and the possible use of a resistance gene from a wild banana ancestor by genetically transforming Cavendish bananas, thereby providing a potential solution for sustainable disease management. Lasting disease management, however, relies on genetic diversity and the research described in this thesis is the basis for developing such new varieties. On October 17th 2018 Nadia Ordóñez defended her PhD entitled ‘A global genetic diversity analysis of Fusarium oxysporum f.sp. cubense (Foc)’ at Wageningen University. In her research the genetic and geographically diversity of Tropical race 4 (TR4) strain of Foc was mapped out using DNA sequencing methods. Bananas are an essential staple food and a significant income for agricultural-based economies in developing countries. Fusarium wilt of bananas, popularly known as Panama disease, is one of the most threatening fungal diseases of banana production. Foc is the causal fungal agent of this disease. The TR4 strain of this fungus affects many local banana varieties as well as the Cavendish cultivar, which accounts for 85% of world trade in bananas. Since all Cavendish bananas are clones of each other and there is little variation, they are highly susceptible to TR4, making the sector extremely vulnerable. In the research of Nadia a molecular detection tool to monitor the spread of TR4 was developed. This assay enables rapid, routine and unambiguous detection of TR4 in the field and is therefore of immense value for charting the progression of its spread. That this is urgently needed, the results provide an image that all TR4 isolates, regardless of the year of isolation and country of origin, were highly infectious on both ‘Gros Michel’ and ‘Grand Naine’ banana varieties , underpinning the risk for banana plantations that only rely on these cultivars. All students are writing their PhD books! Hence, we are in harvest time. We expect dozens of new exciting papers that will move the front forward and together form a solid foundation for a new phase in Panama disease research. On October 23rd, 2017, Jaye de la Cruz successfully defended her PhD thesis titled “Panama disease in banana and neoliberal governance: towards a political ecology of risk”. Jaye was supervised by Dr Kees Jansen and her promotor was Prof. Philip McNaughton. Her thesis casts a different light on a major plant disease in a major crop and underscores the complexity of international action to reduce its risk, particularly by illuminating the power relationships in the sector. We fixed the dates for three students, most other will fix their dates soon likely for graduation in November and December 2018. On June 6th, Ms. Caucasella Diaz Trujillo, Mexico, will defend her PhD thesis titled “Functional genetics and genomics of the banana black Sigatoka pathogen Pseudocercospora fijiensis”. The ceremony is at the Wageningen University and Research auditorium, Building 362, General Foulkesweg 1, 6703 BG Wageningen, and start at 13:30. On October 16th, Ms. Nadia Ivone Ordóñez Román, INREF PhD student, will defend her thesis titled “A global genetic diversity analysis of Fusarium oxysporum f.sp. cubense, the Panama disease pathogen of banana”. The ceremony is at the Wageningen University and Research auditorium, Building 362, General Foulkesweg 1, 6703 BG Wageningen, and start at 16:00. On October 29th, Ms. Nani Maryani Martawi, KNAW-SPIN student, will defend her thesis titled “Fusarium wilt of banana in Indonesia: genetic diversity and phylogeny of causal fungi”. The ceremony is at the Wageningen University and Research auditorium, Building 362, General Foulkesweg 1, 6703 BG Wageningen, and start at 11:00. Since November 21, 2017 Einar Martinez, Instituto de Investigaciones en Sanidad Vegetal (INISAV), Cuba, started his PhD project on Panama disease in banana. In Cuba, more than 179.000 ha of dessert bananas and plantain bananas are grown, which are primarily used as staple food. His research will focus on the diversity of Fusarium oxysporum f.sp. cubense. in Cuba. Furthermore, he will evaluate resistance in Cuban banana germplasm, unravel the race concept in Foc and study the role of the microbiome for disease control. Einar’s project in funded by NUFFIC, the Dutch organisation for internationalisation in education. Researchers from Queensland University of Technology in Brisbane, Australia, have designed genetically modified Cavendish bananas with resistance to the devastating soil-borne Panama disease. This disease is caused by the fungus Fusarium oxysporum f.sp. cubense Tropical race 4 (TR4) and also known as Fusarium wilt of banana. Scientists from Wageningen University & Research in the Netherlands validated the field data. 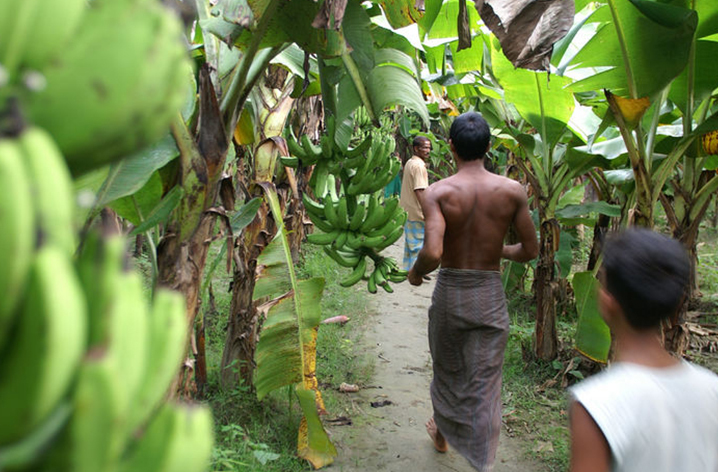 In the world’s first field trial with genetically modified banana plants conducted in heavily TR4-infested soil, one Cavendish line transformed with a gene taken from a wild banana remained completely TR4 free, while three other lines showed robust resistance. The results have just been published in Nature Communications. The team cloned the so-called RGA2 gene from the wild progenitor of edible bananas, Musaacuminata ssp. Malaccensis, which has a remarkable resistance to TR4. One modified Cavendish line (RGA2-3) remained TR4-free for the three years of the trial. Three other lines modified with RGA2 showed strong resistance, with 20% or fewer plants exhibiting disease symptoms over a period of three years. 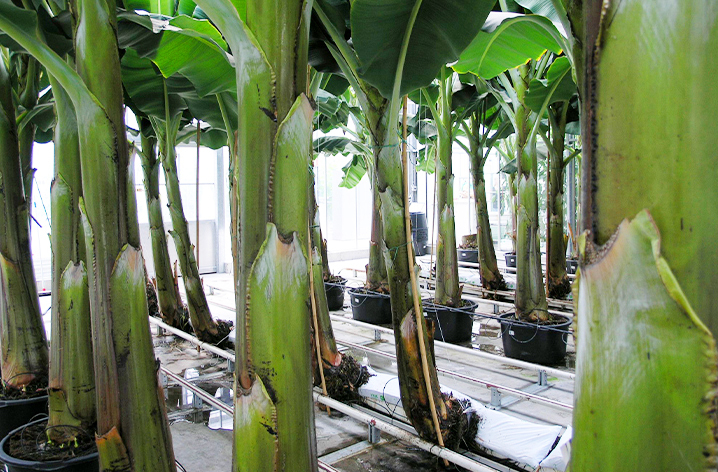 In contrast, 67% to 100% of the control bananas were either dead or heavily TR4-infected after three years, including the Giant Cavendish somaclonal variant 218, currently heralded as being resistant to TR.4. Running from 2012 to 2015, the field trial was led by Distinguished Professor James Dale from Queensland University of Technology. It was conducted on a commercial banana plantation outside Humpty Doo in the Northern Territory in Australia previously affected by TR4. The soil was also heavily reinfested with disease for the trial. While Cavendish bananas have been found to also have this RGA2 gene naturally, it is not very active in susceptible plants. New research is looking at how to ‘switch on’ the gene in Cavendish bananas to make them TR4 resistant. The researchers have begun an expanded field trial on the same plantation, growing the four resistant RGA2 lines and newly developed lines of modified Grand Nain and Williams Cavendish varieties. They have the capacity to screen up to 9,000 plants for resistance and to determine yields and other important traits over the coming five years. The article, Transgenic Cavendish bananas with resistance to Fusarium wilt tropical race 4, can be accessed here. Co-authors with Professor Dale are Professor Gert Kema, Fernando Garcia-Bastidas (Wageningen University & Research, the Netherlands), Dr Anthony James (QUT), Dr Jean-Yves Paul (QUT), Dr Harjeet Khanna (Sugar Research Australia, formerly QUT), Mark Smith (Darwin Banana Farming Company), Dr Santy Peraza-Echeverria (CICY, Mexico, formerly QUT), Professor Peter Waterhouse (QUT), Distinguished Professor Kerrie Mengersen (QUT) and Professor Robert Harding (QUT).